These layers depict eelgrass beds. Seagrass beds are critical wetlands components of shallow marine ecosystems along the Massachusetts coastline. Seagrass beds are critical wetlands components of shallow marine ecosystems along the Massachusetts coastline. Seagrass beds provide food and cover for a great variety of commercially and recreationally important fauna and their prey. The leaf canopy of the seagrass bed calms the water, filters suspended matter and together with extensive roots and rhizomes, stabilizes sediment. Seagrasses are often referred to as "Submerged Aquatic Vegetation" or SAV. This distinguishes them from algae, which are not classified as plants by biologists (rather they are often placed in the kingdom protista), and distinguishes them from the "emergent" saltwater plants found in salt marshes. In Massachusetts, the dominant SAV is Zostera marina or eelgrass. The other species found in the embayments of the Massachusetts coast is Ruppia maritima, commonly called “widgeon grass,” which is present in areas of less salinity along Cape Cod and Buzzards Bay. Widgeon grass, found in the upper reaches of embayments, has a thread-like morphology that makes it difficult to identify using remotely sensed data. It can only be identified and located by on-site survey. The Massachusetts Department of Environmental Protection (MassDEP) began a program to map the state's SAV resources in the early 1990s and since 1995 the MassDEP Eelgrass Mapping Project has produced multiple surveys of SAV along the Massachusetts coastline. Throughout the implementation of this program, MassDEP has continued to adopt and utilize "state of the art" methods to ensure the scientific credibility and practical application of the SAV mapping and monitoring data collected. The MassDEP Eelgrass Mapping Project ranks among the longest sustained seagrass monitoring programs (utilizing the same methods) in the world. The program uses remote sensing to acquire data on SAV extents to monitor the status and trends of the resource statewide. This general approach is comparable to other large scale seagrass monitoring programs in the Chesapeake Bay, Virginia and the Indian River Lagoon in Florida. Unlike several other monitoring and research programs that depend on "in water" sampling for data acquisition, MassDEP relies almost exclusively on remote sensing of aerial imagery as the principle source of information. During the period 1995-2000, the program utilized high resolution aerial photography captured on Kodak 2448 true color film, with strict requirements for the source data layer. The photos were viewed using 10x magnification and the eelgrass polygon data were drafted to pin-registered acetate overlays. The overlays were then scanned at a high resolution and geo-registered to the Massachusetts orthophoto map series for digital distribution. Later years have utilized high resolution digital imagery (0.25m pixel) as the source data. This later method used on-screen digitizing functions available in ESRI's ArcMap. The remote sensing data are supplemented by boat-based underwater video data acquisition to verify benthic habitat signatures. >> View these layers online to see growth or decline in many areas. 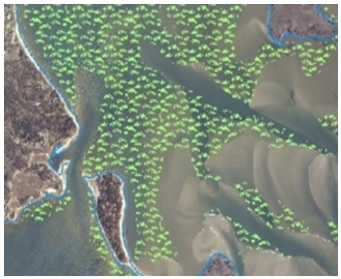 The MassDEP Eelgrass Mapping Project has produced multiple mapping layers of SAV distribution along the Massachusetts coastline. The table below shows the areas covered by the different years. Click on the Project Year below for data documentation and download of individual MassDEP SAV layers. For additional information on the MassDEP Eelgrass Mapping Project, visit: https://www.mass.gov/guides/eelgrass-mapping-project.